WHE is the only organization in history to take inhumane treatment into a courtroom. Our work is the driving factor that has led to the first policy that addresses handling of wild horses and burros. Our relentless litigation spans nearly a decade running from range to courtroom in a grueling marathon to stop abuse and create a framework for accountability to each beating heart of every wild horse. Our work continues to drive accountability. In 2010 our first attempt to stop abuse came in the heat of summer where BLM intended to run newborn foals as much as 25 miles in drought. This case held firm that BLM could not close public lands to keep observers out to hide their practices from public scrutiny. This case attempted to stop abuse before it began. 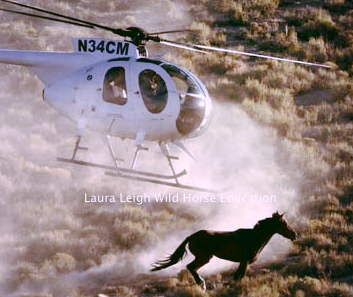 Even though we were successful in court we were chased around the desert and threatened with arrest for days before the agency allowed any public observation of what they purported as the worst disaster in wild horses in history. This set the tone for litigation in our relentless quest to hold BLM accountable through a First Amendment case that lasted half a decade and went up and down the legal system. It also began our efforts to prove that a humane handling policy was critical. Our litigation at Triple B was the first in history against inappropriate conduct at a roundup. Conduct included kicking a horse in the heat, using electric shocks on foals, lack of water in holding and even hitting a horse with the skids of a helicopter. BLM crested a review of the actions to present to the court as we pushed for longer lasting court orders. BLM admitted to the allegations in the complaint in the Triple B review," yet denied that they did anything wrong. We won a stop order and a Preliminary Injunction. This case was a pivot point to bring additional action in multiple HMAs. 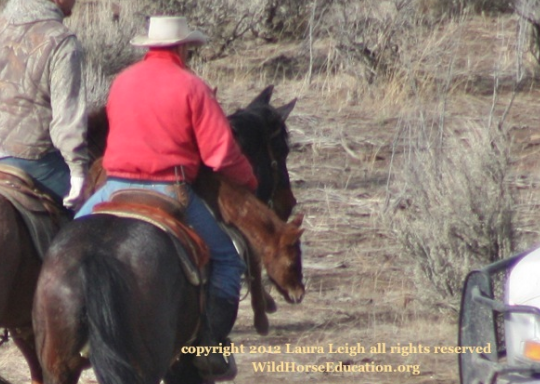 WHE litigation at the Owyhee roundup included inhumane treatment and the severe lack of data in the documents used to justify removing wild horses. The ruling in this case identified multiple, specific, instances of conduct the courts would not allow including running wild horses through barbed wire or foals to exhaustion. This case came on the heels of multiple wins against conduct and was the final court case before serious work was done to create a policy in practice. 2010: Tuscarora; foals run in drought and closure of public lands. Won restraining order against public land closures. Won halt of operations through temporary restraining order. Won Preliminary Injunction against conduct. Jackson Mountain; inhumane conduct and unjustified removal action. Won restraining order against helicopters during foaling season and a large scale removal pushed under a small area of concern was halted. 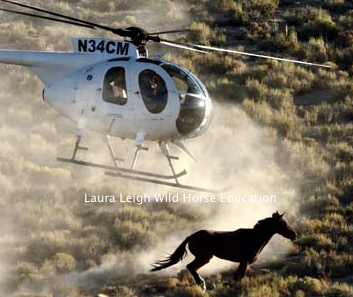 BLM wild horse program went into a sequester over budget debates and funding was limited for removals. WHE efforts went into high gear to litigate for the last of the Sheldon wild horses and stop them from going to notorious killbuyers. Intervention that stopped a roundup from continuing as newborn foals hit the ground at Fish Creek. In fall of 2015 our continuing negotiations pushed a humane handling policy into reality. Policy released in a test phase with a two year review. Legal request for investigation into a lack of enforcement on the ground of policy citing conduct issues repeated at Owyhee in 2016/17 and at Triple B. Litigation teams are ready to roll. Injuries like these are preventable and usually due to human error or faulty equipment. As BLM moves the policy out of beta test, they must create substantive change. If necessary we can create a longer list of supporting litigation. Injuries like these are preventable. You just need to care enough.